So happy to see your new family. Hope you enjoy the challenge. I enjoyed part 2. Lol, the part were the toddler is in the bathroom with dad, so relate to that. My little one cries at the door if I don't let him go in with me. My big challenge is with more than one caregiver in the household. I tell one to do something with the Toddler like feed, bathe or potty train and nothing. Why? Because another caregiver is on the way to check the Toddler. Great video. I love the reading to the toddlers. Nice family. Was surprised to see the toddler sit on the floor in the kitchen to eat. The toddlers I've played always have to find a chair or couch in another room before they eat. I also love that they can help themselves from a platter on the counter. Yep, I get that too. Donnie is really good at taking care of the kids. Yes, me too! I have to keep a good eye on Felix, he is always destroying the books on the shelf. Thank you so much for watching everyone, I really appreciate it. All caught up. Interesting challenge. 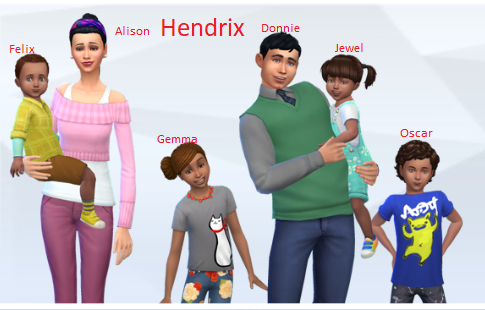 The toddlers are so different from the previous two versions. The fire was really scary! I am always anxious that my Sim will get too close and become ashes. As for the fire alarms. In Sims 3 there was one that activated a sprinkler system. In Sims 4 they only make really loud annoying noise. @MerryWiddow I know, I love the toddlers so much in Sims 4 but really found them bothersome in Sims 3. That was exciting and frustrating. lol The fires sure spread fast, just like in RL. It's scary and frustrating when you can't get a Sim to put the fire out too. Lucky the wife did extinguish it. That was clever of you to find a way to get the wife unstuck. I had alien father/husband Gilbert Tarras (? think that's what I wrote down, or maybe Tarran ) get stuck and could not get him to move. Wish I had thought to try travel. Ended up putting the family in my library then back in the house. I like you're using the video method for your game play.